With my adopted family; Brenton, Will and Chris. 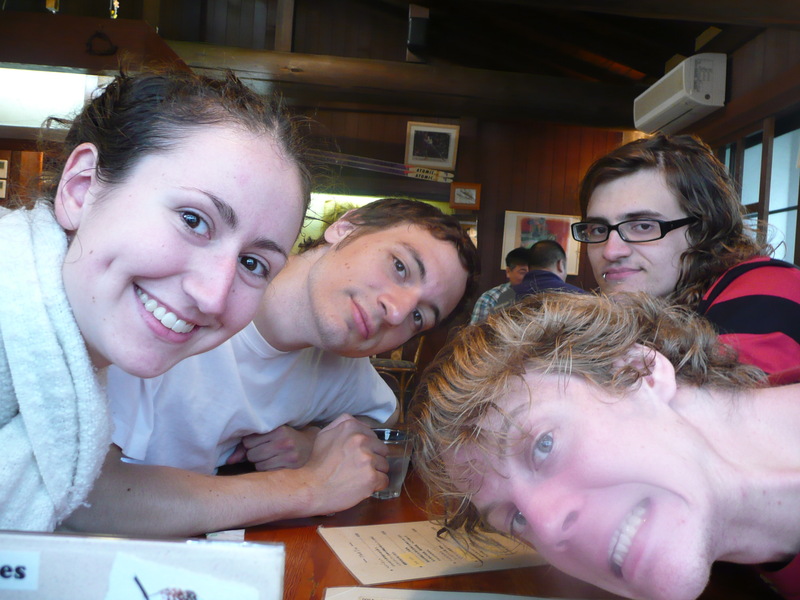 One of my fondest travel memories is of the impulsive road trip that we took to Kusatsu (草津）, an onsen town, in June 2009. Brenton, Chris, Will and I rented a car, got the car-hire guy to program the GPS, and drove. It was so liberating to say, ok we need to get out of the city, and then just do it. We saw some incredible sights; a soaring three-pylon bridge half-built, flooded rice paddies, the night sky from the comfort of an outdoor hot spring bath. We got lost; instead of seeing ancient Jomon period ruins, we found a lonely mountain path with views of a damn under construction. 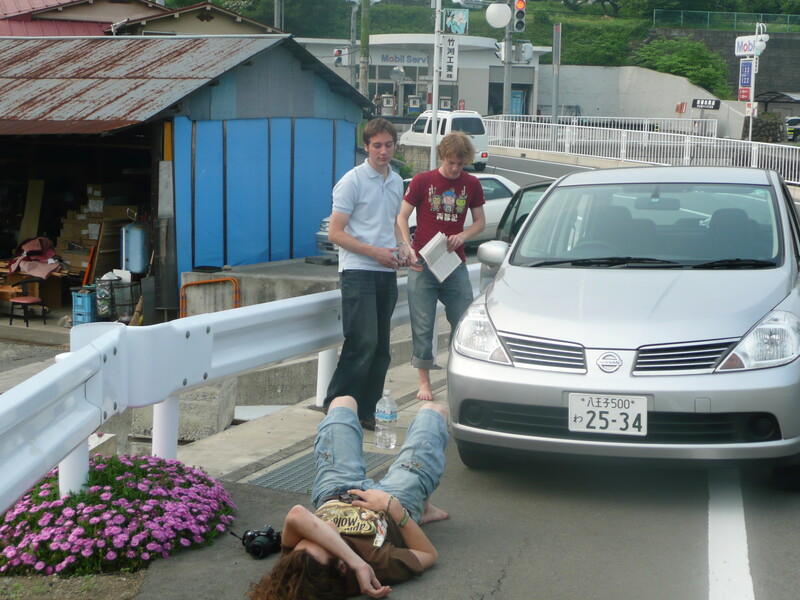 Roadside stop with Ariel Sharon (our car), Haruki Murakami and some confused Japanese carpenters. We had so much fun; water balloons, Haruki Murakami’s Hardboiled Wonderland and the End of the World, a collection of flowers, a road that sung, Ariel Sharon and an Italian place with the worst wine known to mankind. And we became family. Amandine is talking about getting her driver’s license and us hiring a car to drive from Lyon to Geneva to visit the UN in December. I can’t wait! I am off to Europe in just over a month now, and wanted a place online where I can share my experiences with my family and friends, hence “Adventures in Winterland”. I’m counting down the days until I hop on a plane and explore Hong Kong, England, France, Switzerland, Austria and Italy. This will be my first trip to Europe, and it is my graduation present to myself after 5 long years of uni. One of the things that I am most looking forward to about this trip is spending time with my amazing friends who live in Europe, most of whom I studied with in Tokyo in 2009. I can’t wait to have yum cha with Kawin in HK; sit down for a pint with Will, Luke, Joe and Fred in the UK; devour pastries with Amandine in France; sip cocktails with Chris in Switzerland; explore the sights of Vienna with Anna-Maria and Eva; and muck around in the snow with Patrick in Italy.